What is up? I’m over here begrudgingly noting the fact that I had my seventh – yes seventh – night in a row of food dreams. On one hand I am so ready for this Whole30 to be over. On the other hand, I only want it to be over so I can indulge in an all-out carb-o-palooza which isn’t really my goal here. 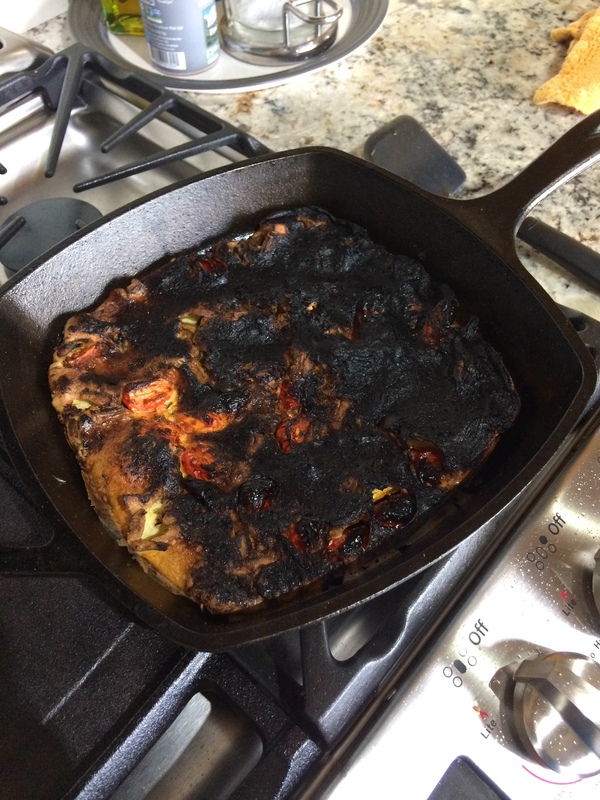 And I burned my breakfast frittata. Sad panda. I even put the good mushrooms in it. No wonder I’m so cranky pants this week. So if you’re embarking on a Whole30 and are a petite yet relatively active young-ish woman, eat more than this. Since I am going through a major “can’t even” I’ve been making whatever food sounds good that doesn’t require too much prep. 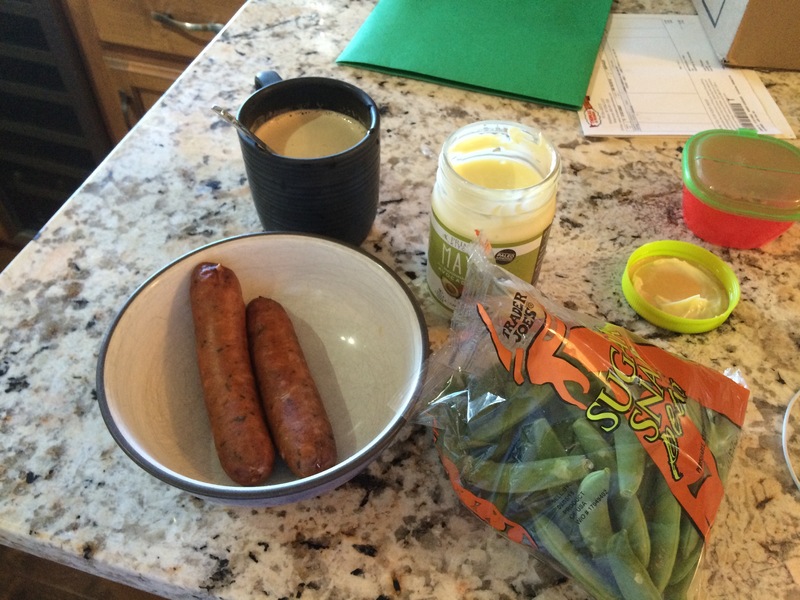 I nuked a couple of chicken apple sausages and ate a bag of snap peas with primal mayo. Added some coconut milk to my coffee, annnnnd we’re done. 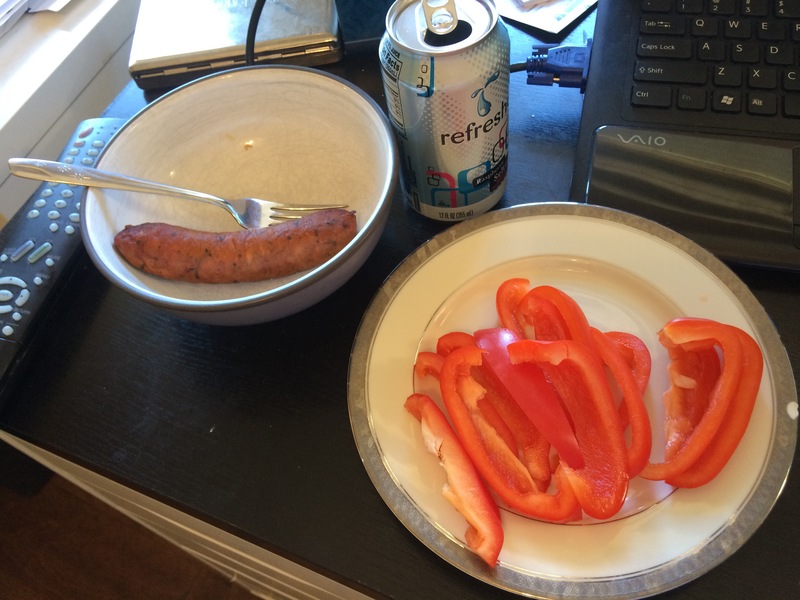 Lunch was the return of chicken apple sausage, with a whole cut-up bell pepper. I forgot the fat, but since I had about a half a can of coconut milk with my eleventeen cups of coffee, I figured it could slide. 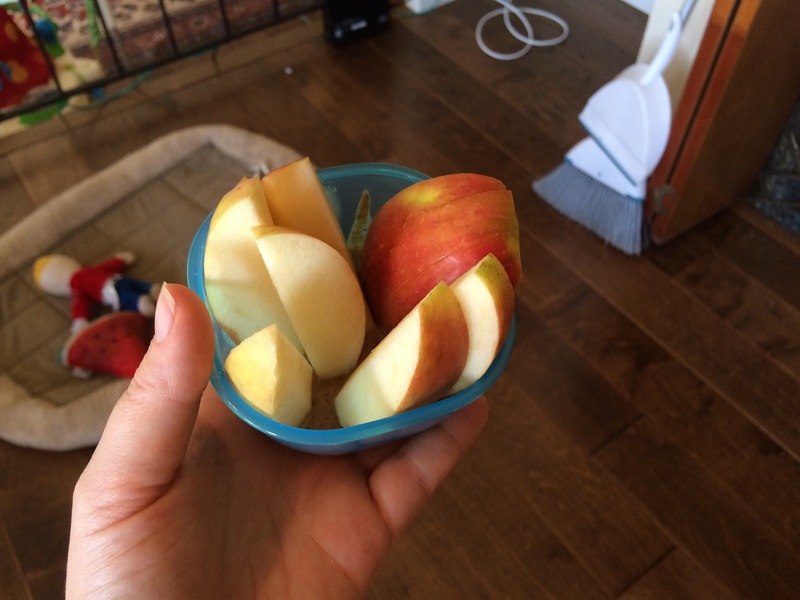 You’re discouraged from snacking on a Whole30, but I had a cut-up apple with almond butter midafternoon because I was getting super hangry. I was almost going to have chicken apple sausage AGAIN, but I pulled myself out of the Can’t-Even loop with Amber’s comment on this pork chop recipe. 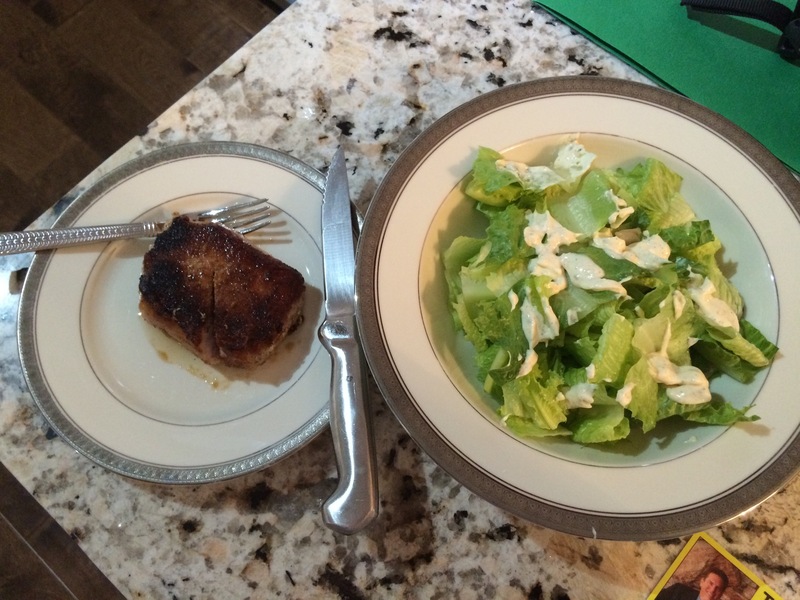 I didn’t exactly follow the recipe, but it was a great way to sear and cook a pork chop. I also found out I had all the ingredients to make the ranch dressing from the Whole30 book, so paired with a head of romaine it was a quick and decent dinner. I thought I was doing okay, and my “meh” about the Whole30 was something else. Now I’m thinking that I’m just not eating enough. It’s sort of a mental laziness thing. It’s hard to have Hulk and Squish just heat up some corn dogs for lunch (*cough* or breakfast) while I’m chopping and roasting and stuff to make a “funner” meal that’s palatable. I’m getting stuck in the “convenience” mindset. Plus, the cost is really weighing on me. The first couple weeks, I didn’t even look at prices when I shopped. I would buy the grass-fed meat, whatever organic veggies my little heart desired. Then Hulk and I had a little heart-to-heart about our grocery bill (the $16 jars of ghee may have been a topic for discussion) and now I’m trying to be more mindful of what I put in the cart. It’s do-able on a budget, but not nearly as much fun in my book (#firstworldproblems, I know). So I’m shopping at the local Safeway instead of Whole Foods, buying conventional veggies and whatever meat’s on sale. And it sort of swiped some of the magic from me, mentally. Sort of a “perfect is the enemy of good” sort of deal. 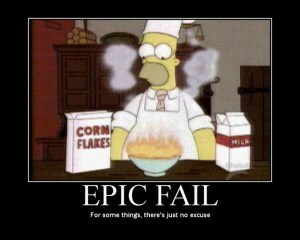 Hence the food dreams and Captain Insane-o cravings. After all, if my artichoke’s not organic, then maybe I should just plow through this box of cookies, right? Thank goodness I’m too darn stubborn to give in, but I’m really hoping I can reconcile this “all or nothing” mentality before Day 31, because I don’t want to go nuts on donuts and anything else that also rhymes with “donuts”. So I’m going to put my big girl pants on and get thee to a kitchen to cook all the things. Because I am not going out like that.